This Whole30 food list is a quick reference to have on hand of what you can and cannot have on a Whole30 protocol. Print it out and keep it with you to stay on track! 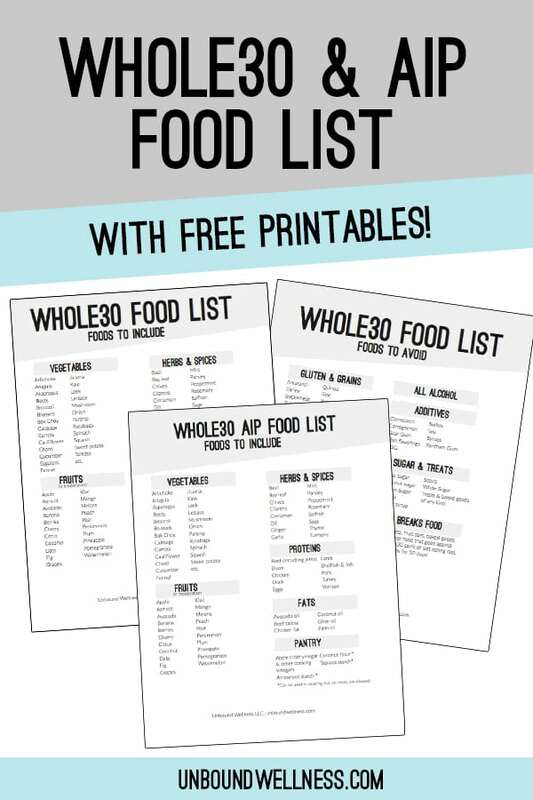 Plus, I’ve also included a Whole30 and AIP crossover food list to help my fellow autoimmune sufferers. When I first heard of the Whole30 I thought, “why would I need that? I already eat healthily!” However, the Whole30 is so much more than just avoiding macaroni and cheese from a box. It’s about embracing whole, nutrient dense foods, and avoiding inflammatory foods like grains, dairy alcohol, and most impactful for me, sugars! It’s not about weighing, counting, or measuring… it’s about health! The Whole30 gives you 30 days to calm inflammation, break up with the sugar addiction, and come back to your love of real food. It’s something that we could all use, but especially those of us with autoimmune disease. I know what you may be thinking… why do a Whole30 if you’re already doing an autoimmune protocol diet or a paleo diet? These protocols are tremendously healing, but still allow foods like chips, sugars, and treats. And in reality, though they’re fine in moderation and help make these protocols more sustainable long term. these aren’t necessarily the most healing foods. Taking a 30-day break from these foods can have a powerful impact on your healing journey, as well as your overall relationship with food. As a member of both the autoimmune and Whole30 communities, I get a lot of questions about the two and how you combine them.Why would you combine them? What’s the difference? A whole30 exists as a 30 day reset to get back to eating real food. It’s designed to help reset your mindset about food, and go all in with nourishing, whole foods for 30 days. It’s not a diet, it’s not about weight loss, it’s about eating whole foods and feeling great! A whole30 may be right for you if you feel like you’re a little lost in the real food world and need a reset to step away from the treats, chips, snacks, and just come back to real food for 30 days. Why do AIP and a Whole30 together? The autoimmune protocol is designed for those living with autoimmune disease to help calm inflammation and heal. Though this protocol does an amazing job at eliminating inflammatory foods and adding healing foods, there’s still a lot of room for treats, sugars, chips, and the like. These treats can be fine in moderation, but if you’re on the AIP and feel like you need a break, combining it with a Whole30 for 30 days is a great step! Vegetables. Vegetables should arguably be the base of a healing diet. Enjoy vegetables like leafy greens, sulfur-rich veggies, and vegetable starches like sweet potato and squash. Fruits. The goal of Whole30 is to avoid threats, but having an apple here and there is totally fine. Proteins. Enjoy healthy proteins like chicken, fish, beef, bison, turkey, etc. Healthy fats. Healthy fats like coconut oil, olive oil avocado oil, animal fats, and ghee are all Whole30 friendly. Ghee is technically dairy but is permitted as it does not contain lactose or casein. Nuts and seeds. Almonds, cashews, sunflower seeds, chia seeds, and other nuts and seeds are permitted. Pantry staples like spices, vinegar, and flours if used properly. If you’re using coconut flour to bind meatballs, you’re in the Whole30 clear. However, if you’re making waffles, it’s time to take a step back. Coffee. Black coffee or coffee with non-dairy milk is fine on a Whole30. Grains. Grains like rice, corn, wheat, oats, and more are all omitted on a Whole30. Dairy. Butter, cheese, milk, ice cream, etc. are not Whole30. The only exception is ghee. See above for more. Legumes. Legumes are known to be harmful to the health of our gut and are not permitted on a Whole30. This includes black beans, chickpeas, lentils, soy, peanuts, etc. Alcohol. No beer, ciders, wine, or liquors of any kind. Your body will thank you! Plus, no added alcohols in things like vanilla extract, etc. Sugars. All artificial and natural sugars are out on a Whole30. No honey, no maple syrup, no stevia, no coconut sugar, no exceptions. Treats, junk foods, or chips. Even if it’s Whole30 ingredients, it’s not Whole30 if it’s a junk food. We’re talking about chips, pizzas, cookies, etc. Additives. No carrageenan, sulfites, nitrates, or gums. If you can’t pronounce it or really decipher what is it, don’t bother trying to justify it. It’s just 30 days!! An AIP Whole30 is a mix of a Whole30 along with an autoimmune protocol. This can be an incredibly healing and beneficial step to take during an AIP diet as it helps cut out excess sugars that lead to inflammation. Though I don’t live my life full AIP anymore, I do still follow a modified version of this protocol. Learn more about the AIP diet here! Eggs. These are known to set off inflammation. I promise you can do it! Nuts and seeds. Not great for the gut and inflammation. Additives and seed oils. The Whole30 is designed to help people get back to real food, and more so for the masses rather than those with serious chronic illness like AIP is. Thus, Whole30 still allows some additives like citric acid, and seed oils like canola in extreme moderation while eating out. These foods should still be avoided if you’re AIP. Coffee. Cutting out coffee has amazing effects on your blood sugar balance, and inflammation! Start with mindset. Everything always come back to your mindset. If you enter any protocol or lifestyle change with a chip on your shoulder about it, you’ll be less successful. View these 30 days as an opportunity for healing, discovery, and recalibration! None of this is meant to last forever. Whole30, AIP, and even full-on Paleo aren’t always meant to last forever. These are short-term healing protocols that help you reset, heal, and learn. You may come back to them to repeat or take the principles throughout everyday life with you, but strict diets shouldn’t last forever. Planning ahead is your friend! I was so close to crashing and burning on my very first Whole30 week because I didn’t plan like I needed to. Make a plan to prep food ahead, and have emergency food like my ground beef jerky on hand. Support is everything! Having community support is so important. Talk to a friend about jumping on a Whole30 with you, or tap into the huge online community that Whole30 has to offer. My hashtag is #unboundwellnessw30 if you want to follow along with me 🙂 Also, be sure to check out the Whole30 website and books for tons more support!